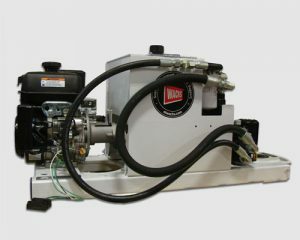 E.H. Wachs hydraulic power units are the ideal choice for smooth, reliable hydraulic power, in the shop or in the field. Powered by gasoline, diesel, or electric motor in your choice of cart, trailer or skid mounting, there’s a unit to fit your exact pressure and flow needs. Hydraulic power units (HPUs) pack more power in less space than any other source. Because they’re completely sealed, hydraulics are the perfect choice for partial immersion, offshore use, the desert and other difficult environments. No matter which unit you choose, every model offers Wachs rugged reliability, convenience and perfect flow and pressure delivery.